São Paulo has improved sustainable mobility through new bike and bus lanes, a revised master plan, and an innovative approach to support developers creating mobility solutions. Photo by Stanley Calderelli/Flickr. The city of São Paulo has won the 2014 Enterprising City/State MobiPrize following its support of user information and public participation platforms to advance sustainable transport solutions. MobiPrize was launched in 2012 by the University of Michigan SMART (Sustainable Mobility and Accessibility Research and Transformation) initiative to honor entrepreneurs and governments that support innovative ventures to improve quality of life through sustainable mobility. Other winners include startup G-Auto for its work professionalizing India’s auto-rickshaw industry and Scottish Enterprise for setting a framework for innovation in transport. São Paulo is empowering citizens to create transport solutions by fostering innovation and opening data. The São Paulo department of Transport (SMT) founded the Mobility Laboratory (MobiLab) on the principles of innovation, transparency, and public participation, with the goal of improving mobility management through data analysis and the creation of participatory solutions. To achieve these goals, MobiLab has hosted multiple “hackathons” focused on urban mobility and city planning. Hackathons are typically multi-day events where a large number of programmers gather to collaborate on software project ideas. Though they are becoming increasingly common in the United States, they more rare in the developing world. Further, governments in Latin America, along with other emerging economies, have traditionally been hesitant to releasing city data to the public. MobiLab, however, opened its data to developers and used strategic partnerships across academia and industry to garner support for its hackathons, the first of which occurred in March 2014. MobiLab’s efforts are already yielding concrete benefits. For example, newly released data has empowered multiple apps to provide users real-time transit information that had been previously lacking. São Paulo also built an innovative crowdsourcing platform to increase public participation in revising the city’s master plan. This VGI (Volunteered Geographic Information) platform allowed residents to provide input to the plan, and will help citizens evaluate whether it meets public demands. Citizen engagement was a focus of the master plan revision. According to city leaders, the revision included the largest participatory planning process in the city’s history, consisting of 114 public hearings, 25,692 participants, and 10,147 contributions. While the MobiPrize award emphasized São Paulo’s effort to support innovation and entrepreneurship, the city has made numerous strides to improve sustainable mobility in other areas, as well. Public transport fare increases and perceived non-productive investments for the FIFA World Cup incited strong protests in São Paulo. In response, the government quickly and effectively implemented “Dá licença para o ônibus” (Make way for the bus) at the beginning of 2013. The program’s goal was to have 220 km (137 miles) of dedicated bus lanes by the end of the year. The city exceeded this target, and now has 344 km (214 miles) of dedicated bus lanes. Though the program was strongly contested by drivers before implementation, 88% of residents now approve of the exclusive bus lanes. These lanes create a more efficient use of urban space, as one bus lane can allow for transport of ten times as many people per hour than a lane dedicated to cars. In São Paulo, the implementation of exclusive bus lanes reduced passengers’ travel times by an average of 38 minutes per day. 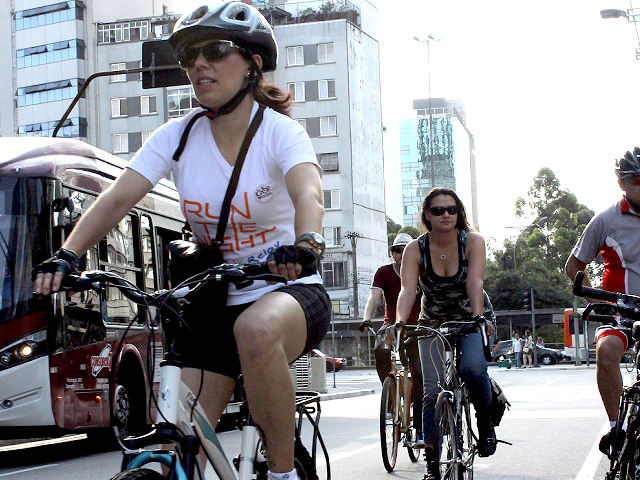 São Paulo is also improving its bicycling infrastructure. Since June, the city has added 16 km (10 miles) of bike lanes, bringing its total to 79 km (49 miles). Mayor Fernando Haddad aims to increase this number to 400 km (248 miles) by the end of 2015. Finally, the city’s new master plan prioritizes sustainable development by enhancing public spaces and discouraging the use of cars. For example, the plan calls for transit-oriented development (TOD), increased density around transit corridors, and the elimination of parking minimums citywide. Even after these aggressive actions to support sustainable mobility, São Paulo still has room to improve. In 2013, traffic congestion cost the metropolitan region more than R $ 69 billion (USD $ 30 billion), equivalent to 7.8% of metropolitan GDP. São Paulo must continue to invest in projects that cultivate a culture of participatory planning and open data. Hackathons are one tool to foster a more creative and innovative economy that produces sustainable mobility solutions. They should be accompanied by continued efforts to improve the quality, completeness, and accessible of data. By creating a culture of sharing public information and engaging citizens, São Paulo can continue to become more responsive to citizens’ needs, and can empower entrepreneurs to develop innovative solutions to sustainable mobility challenges. Maria Fernanda Cavalcanti also contributed to this post.